The federal government has filed fresh charges against four members of Indigenous People of Biafra (IPOB) being tried alongside Nnamdi Kanu, the group’s leader. The three-count charge which bothers on treasonable felony was filed at the federal high court in Abuja, where they are being tried, on Tuesday. The IPOB members — Benjamin Madubugwu, Chidiebere Onwudiwe, national coordinator of IPOB; Bright Chimeze, and David Nwawuisi — were being tried alongside Kanu also for alleged treason. But the absence of court in previous court sittings has stalled the trial. 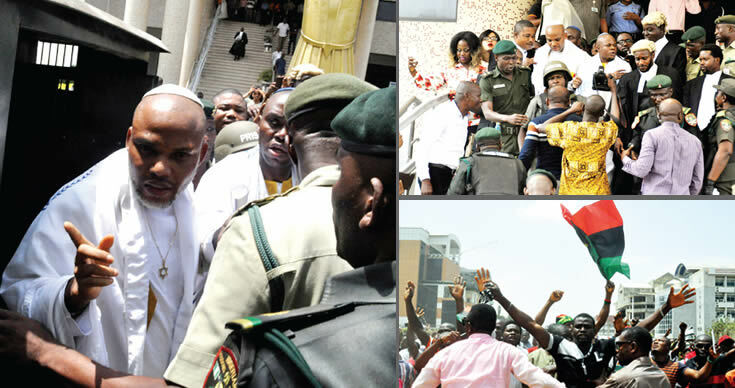 At the resumed sitting on Tuesday, Shuaibu Labaran, the prosecution counsel, called the attention of the court to the continued absence of Kanu in the trial. He, therefore, requested the court to hear the separate charges against the four other accused — which Binta Nyako, the presiding judge, granted. All the four accused pleaded not guilty to the alleged offence after the charge was read. The court adjourned the case till Thursday, March 22, for further hearing, after Nyako warned that she will not allow further waste of time regarding the case. TheCable had reported that Kanu and his wife were spotted in Ghana by security forces. He has not been seen anywhere in Nigeria since soldiers raided his residence in Abia during the Operation Python Dance military excercise. Instead of d fed govt 2 gocus on d issue of herdsmen,dey are busy looking 4 Nnamdi kanu. Instead of d fed govt 2 focus on d issue of herdsmen,dey are busy looking 4 Nnamdi kanu. Nnamdi kanu should be left alone, he is just a toothless dog….. Heard he was saw in ghana few weeks back….. The presidency should face d herdsmen killing innocent people and d boko haram.